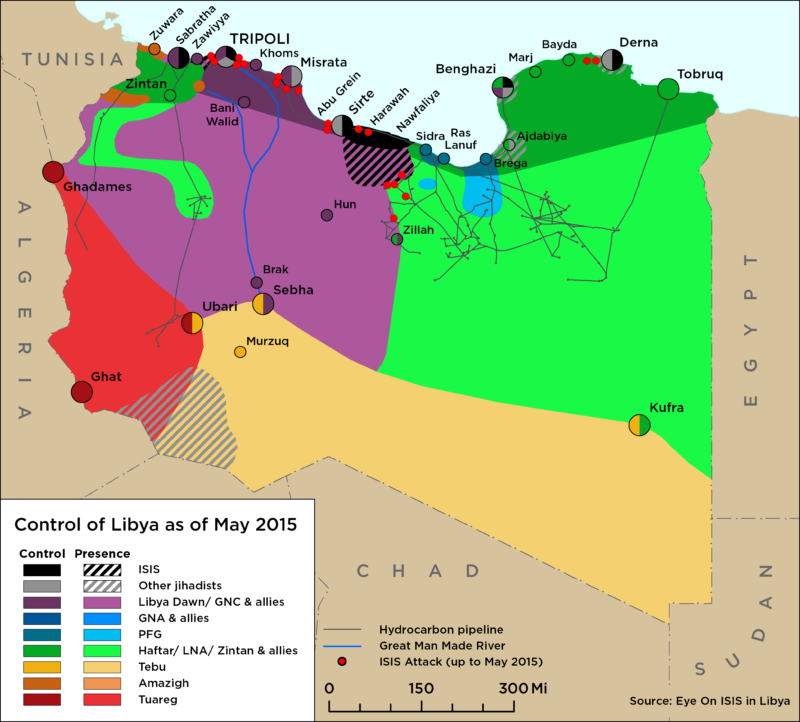 The Libyan National Army (LNA) mobile force continued to advance southward into the Murzuq region last week, entering Ghaduwwa town on 31 January. Many of the local Tebu in the town welcomed the LNA. However, the LNA has met resistance from Tebu fighters, in particular, those reportedly affiliated with foreign Chadian groups. On 1 February, clashes broke out between LNA forces and local armed groups near Ghaduwwa town, reportedly killing 4 and injuring another 24 LNA fighters. The local groups belong to a coalition dubbed the ‘Southern Protection Forces’, based in the Murzuq Basin. On 3 February, the LNA-aligned air force undertook airstrikes in the Murzuq area, causing several casualties and some damage to vehicles. Local media reports say 7 people were killed and over 20 injured. Currently the LNA have ground forces present in Ghaduwwa and Taraghin, east of Murzuq. 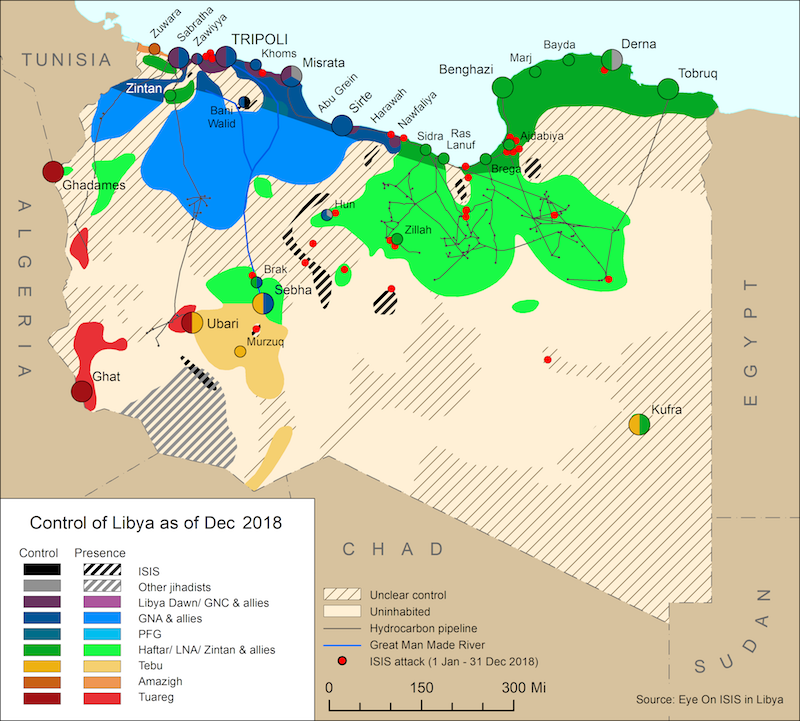 On 30 January, the Libyan National Army (LNA) spokesman Ahmed al-Mismari stated that the LNA now has three axes of connection to Libya’s western region, based out of al-Saddada, Hamada, and al-Shuwayyrif. This coincides with significant declarations of support for the LNA in the western region over the last week. On 31 January, the Zawiyya Operations Room published a video announcing their support for the LNA and saying they were prepared to undertake operations on behalf of the LNA. Last week, a delegation of tribes and officials from Zawiyya met with Khalifa Haftar in Benghazi as part of a visit to eastern Libya. They reportedly discussed striking a deal with the LNA on the condition that commanders from the Abu Hamira tribe, who are being held in the East, are released. On 2 February, Haftar held a meeting with the Zawiyya Military Region commander, Brigadier-General Muhammed al-Tahish. This led Tahish to issue a statement reinforcing his support for the LNA and their operations in the western region, including Operation ‘Cordon Hamada’. On 1 February, Zintan’s Movement of State Institutions published a video stating their support for the LNA’s operations in the northwest and southwest regions. The group also called for the ‘liberation’ of Tripoli and rejected the statements made by UN Envoy Ghassan Salame to the UN Security Council on 18 January, where he expressed concern over LNA operations in the south. On 4 February, a militia group based in al-Shiyab, in the Nafusa mountains south of Tripoli, released a video pledging their support to the LNA. On 2 February, the GNA’s Chief of Staff Abdurrahman al-Taweel stated that the GNA was not coordinating with the LNA in its operations in the south, but declared that the Libyan army was unified. He said that it is only the political institutions that are divided and that he hoped coordination between western, eastern and southern regions would occur in the future. On 29 January, Zintani forces under the command of Government of National Accord (GNA) Western Commander, Usama Juwayli, mobilised to the Souq al-Khamees area in southern Tripoli in order to move from there to Tarhouna to confront forces aligned to the 7th Brigade. This prompted the GNA’s Ministry of Interior to release a statement threatening legal action against any military mobilisation by any group outside or inside Tripoli that did not come under the new security arrangements.